Copying objects from one drawing to another is a common task. You can use the Windows Clipboard and the drag-and-drop methods. When working with 2 drawings open, choose View tab> Windows panel> Tile Vertically (or Horizontally) to view both drawings at the same time. Note: You can use these techniques within a drawing as well, but the COPY command provides more options and accuracy. Most people know that they can copy objects in a drawing to the Windows Clipboard and then paste those objects in another drawing. But there are a couple of tricks to this process that can make your work go more quickly and provide more accurate results. When you use the simple copy-and-paste procedure, you don’t have much control over the placement of your object in the second drawing. That’s because this process uses the lower-left corner of the extents of the object as the base point, which may not be useful. For example, here you see this process with a circle. As you can see, the base point isn’t on the circle, making it difficult to place the circle accurately. 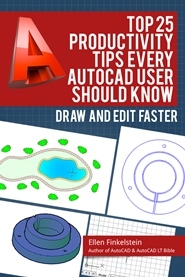 Therefore, AutoCAD provides you with 2 special tools for copying and pasting. Hover the cursor over the object and right-click to display the shortcut menu. For multiple objects, select them first, and then right-click. Choose (Clipboard,) Copy with Base Point. This is the COPYBASE command. As you can see in the figure, you can also press Ctrl+Shift+C. At the Specify base point: prompt, use an object snap to specify the base point. Click in the other drawing. Paste, using Ctrl+V, or by clicking Paste on the Standard toolbar. You can also right-click and choose (Clipboard,) Paste from the shortcut menu. Your cursor is now at the base point you specified, so you can accurately place the object. 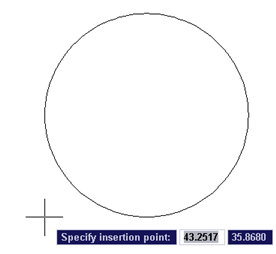 Specify the insertion point you want. Here, the base point was set to the center of the circle. The 2nd tool is Paste to Original Coordinates. If you have two drawings that are very similar, you can use this feature to place the object at the same coordinates as in the original drawing. Just copy the object(s) to the Clipboard, and activate the 2nd drawing. Then right-click and choose (Clipboard,) Paste to Original Coordinates. If those coordinates are not in the current display, do a Zoom Extents to see the pasted object. Drag-and-drop doesn’t give you the same control over placement, but it’s a quick way to copy objects. Note that AutoCAD automatically copies objects from drawing to drawing, so that you don’t need to press Ctrl as you drag. To copy, select the object or objects. Then click the object and hold down the mouse button until you see the drag-and-drop cursor. The only gotcha is that you need to make sure that you don’t click on a grip, because that will just make the grip hot. 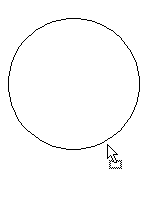 Then drag the cursor to the other drawing and release the mouse button to place the object. You’ll probably need to adjust the placement, using the MOVE command, or by using grip-editing. I enjoyed this post (tip) It was explained in easy-to-understand writing and I learned sth new on the insertion point of copy-paste command which I didn’t know. Thanks and keep posing. I have a request. Is it possible to put a user friendly print button for your tips? I will investigate a printer-friendly plug-in. Glad you enjoyed the post! When you right-click, choose Clipboard and then you’ll see the Copy with Base Point option. I’ll update the blog post. Is this possible with AutoCAD 2012 for Mac? The copy and paste commands don’t seem to work between drawings. Is there a quick solution to copying and pasting to original coordinates, when you have a drawing from another user or office but you do not have the third part software that created the drawing? Without saving back to R12 to strip the data links from the drawing then opening the drawing again and saving to the current format. I do realize that if I had an object enabler that this would solve my problem but my question is what if I don’t have the object enabler? Sorry, I don’t know. It would also depend on the specifics of the programs used. Hi.how can i use the copy and paste command if the drawing has different scales?thanks! All drawings should be drawn to real-life scale. So, for example, copying a refrigerator from one drawing to another would work. You should scale down a drawing only in paper space, in a viewport on a layout. But, you can certainly use the SCALE command to change the size of objects, if you need to. Hi, I installed Autocad 2011 for mac and I can’t find the command “paste to original coordinates”…maybe it’s called with another name, I don’t know…any suggestion? Try the shortcut menu. If you have a 2-button mouse, right click. If not, perhaps Shift + right click? when I use the cursor select method to move one object to another dwg the object changes to a white drawing border outline and the object does not paste into the 2nd dwg. I can’t copy object between dwgs. 2nd dwg was created from 1st dwg. I can’t find what is switched on or off in the dwg. I normally can copy between other dwgs. I need an another command for copy in autocad please sugget me. Paste to Original co-ordinates is always greyed out in 2012 (Acad MAP 3D). I’ve ssen this complaint often on the web. Any ideas please. Great blog, thanks. I just tried it and it wasn’t grayed out. But it will certainly be grayed out if you haven’t first copied something to the clipboard. Try selecting an object in one drawing and pressing Ctrl + C. Then go to another drawing and see if Paste to Original Coordinates is available. Hi Ellen I’m trying to copy/paste some points (X,Y,Z) but when I paste it has copied only (X,Y) Z=0.How I can copy all 3 dimensions? 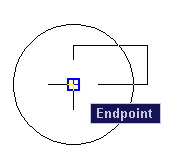 Try using an object snap to select the from point and make sure that the OSNAPZ system variable is at it’s default setting of 0 so it picks up the Z value. Thanks Ellen, for the tips. It helped me to copy an object from one of my Cad Dwg to another. Originally there was no common base point, but I created a common base then copy pasted. Thanks again ! PasteToOriginalCoordinates do not work in ACAD 2011 MAC VERSION!!!!!!!!!!!!! 1000 thanks for your tuts. Made a lot of things much much easier and faster!!! for me. Is there a way to paste the objects into a different layer in the new drawing? Thank a lot for the tip. I used it to copy a collection of objects. But it did not copy DIMENSIONS. Any further tip? Will be much obliged. I’m trying to copy the same object multiple times, but each time from a basepoint of the object that was just copied. I was trying to go off of the copy single command, but would like to have the object just pasted automatically selected to copy again. Any help would be greatly appreciated. Perhaps try multiple copy, which will automatically repeat the command. Or ARRAY. I have had the problem multiple times where I am copying from one CAD file to another and when I paste it into my new file, the scale is out of whack. I paste it in and it is far smaller than the scale which I am using so it looks like a mini version of what it should be. Aside from guessing the scale and scaling it up, I am missing how to copy it and match the scale in the new drawing. I’m wondering if the objects contained blocks that had a unit attached. When you create a block, you can attach a unit, such as inches. If you put that into a drawing whose unit is something else, you might see that problem. Try resetting the block in the original drawing to unitless to see what happens. Here’s an example in the contact of WBLOCK: https://allaboutcad.com/write-blocks-to-save-them-as-separate-files/, but it applies whenever you create a block. 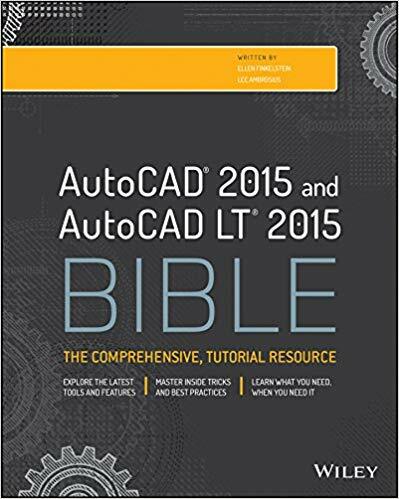 Hi Ellen, I have just switched from a very old version of autocad LT to 2012. I cannot get the copy paste command to work between drawings. IN the old version, you would simply select Edit, Copy (or copy with base point), then switch to the drawing where you wanted to paste your copied objects and simply select paste. I have tried all of your suggestions above and cannot get anything to work. I am trying to copy a section of an old drawing into a new one. Not just one object. That’s good, because I didn’t have a clue as to why it wouldn’t work. I am having the problem that no matter what I COPY the PASTE is different. For example, I copy text from one layout and would like to COPY then PASTE on a diferent layout, but the item copied is not pasted. Even if I WBLOCK the item I comes out sometinng different generally a simple line or a cross. I cannot seem to figure this one out. I’m not sure what is causing this, but are you working in 3D? If you copy something from a non-World viewpoint and paste it in a different one, it could look like a line. Test in a new drawing with just one object and not changing anything else. Recently I got a drawing from a client who had it saved from autocad 2007 to 2000ver. When I try to copy this dwg and paste into acad2005 it does not copy all elements and it gives me a message about proxy settings. I also realized pasting of some elements does not happen to the spot I select,instead it does paste very far in the model space,which you can notice when zoom out fully. no, but perhaps your client could save to 2006, which I think was the new format just before 2007. Why do you copy and paste instead of just opening it? Is it a 3D drawing? Just trying to give you some ideas to troubleshoot. That’s what the blog post is about. What in the instructions didn’t work for you? Hello. I am trying to copy some items from one file to another. For some reason it is only copying some of the object. The object has many lines and shapes all on the same layer. It has worked normally before this. To troubleshoot, try copying them to a new drawing. If they’re in a block, try exploding the block. If they aren’t in a block, try making a block out of them. I have been doing the things that you specified, as to copying from one drawing and pasting into another, I am having trouble with objects that I have copied first staying in the clipboard, and no matter what I have done I can not empty out the clipboard so that I can copy and paste another drawing, the old copy is still there, and the new copy is apparently not there. but even when i copy using above method, the drawing in the copied file is not visible. but wen a used CTRL-A and see the properties, it show all the number of line…but the drawing is not visible. I have a names of blocks (eg 10 nos between 100nos block) and i want to just copy that 10nos blocks among 100 nos blocks, how can i copy those 10 among 100 nos.? Autocad for Mac: Paste to original coordinates work around. If you do not have the Clipboard menu option of ‘pasting to original coordinates’, simply follow these steps. 1. Select elements in the proposed property drawing. And if the coordinate system is the same in both drawings your elements should be located correctly. Hello, I use copy w/ base point and paste between drawings on a regular basis. just installed ACAD 2014. Pasteblock is not working. no error msg…just does not paste in copied objects. I can use ctrl V but then the objects are not inserted as a block but as separate entities. any ideas? or simply i just expend all the money that i had in the world and can not work in my non-traditional dwg.s S.O.S. Hello Ellen, I followed your copy and paste tutorial but when I paste into my second drawing the object is not to scale. Both drawings are copies of a “master” drawing of my factory layout. I created a new object (in this case a set of double doors) and grouped it. Since it didn’t work to scale I ungrouped and tried again with same result. Then I grabbed another object created by someone previously and it works to cut and paste as it goes in to the drawing at the same scale. Do I have to set something when I am creating an object so it will copy and paste to scale in other drawings. Both of my drawings are the same real life scale. Hello Ellen, I am using Autocad LT 2012. The problem I am having is copying a photo and placing it into my autocad drawing. When I paste it in it works fine but the next time I get into that drawing the photo has disappeared leaving a rectangular shell. Do I need to do another process to keep the photo from disappearing? Deborah, Instead of copying and pasting, trying inserting it from your computer. Let me know if this helps. I recently copied a small group from a drawing that had been made in and educational version of AutoCAD 2014 and pasted it into a large drawing made with a standard version of AutoCAD 2014. Now when the main drawing made with the standard version it opens it a drawing made with the educational drawing. Even after deleting the pasted items and purging the group and re-saving it still re-opens the drawing as if it were made in an educational version. Please can you tell me if it is possible to do anything about this? Chris. Chris i had the same problem years ago i got a scafolding and formworks drawing from a sister company and inserted it in some drawings and i had to delete the drawings if you are Lucky you can go to the drawing with explorer and rightclick and choose a earlier version and restore it. Maybe Daniel Kuhmann [Daniel.Kuhmann@autodesk.com] can help you. I have a problem and I have no clue how this happened nor how to solve it. Hope you have any idea. Hi, Can you suggest me how to copy array and paste one element of array in one click and next element in next click and so on..
Hi anyone know how to create a co-ordinate using lisp. I have tried but i’m getting the co-ordinate value in 5digit no (12546.63)and so on. Please if any one know plz tell me step by step procedure. I can copy and paste a drawing file but I cannot copy another drawing. When I paste, the previously copied drawing comes in. Please help me. I got some drawings from a vendor and need to copy/paste the content from the vendor Model Space into the Model Space of my new drawing. Ctrl+Shift+C works to bring over the material, but apparently there are various attributed blocks that all come over with different scales! Some of these seem stretched in only the X dimension, but when I check the properties (in both drawings) X=1, Y=1, Z=1. For example, their title block comes over with the border scaled differently than the text block, but I can’t re-scale the parts independently. I also tried WBLOCK with similar results. I think their original drawings were auto-generated from ePlan. I’ve never seen anything like this before. Has anybody got an idea of what’s going on?? Thank you for the “copy with Base Point” tip…. the wall thickness in the original is 0.25m and when copied positioning at ” # 0,0 ” the wall thickness becomes 0.2498m. Q: how do I maintain the same wall thickness when copying to the recipient drawings. Kenneth, maybe the two drawings dont have the same settings for the units’ precision level. Type in UNITS at your command prompt and check to see what precision level you have set. Set the precision to a higher level (the same in both drawings) and then see if you are getting the same result. I am trying to copy a table I created in AutoCAD from one drawing to another and have it look exactly the same. However, the text formatting doesn’t hold through the paste. It changes some of the text from how I formatted it to another text style. Not what I want. Some text becomes huge. Also the table proportions seem to be different also for the size of the cells. Any ideas? Thank you. I tried to copy an object from a different drawing to my working drawing. When I paste the object, the lines looks like Pline with more thickness. May I know what could be the problem and how to rectify this? Thanks..
Can I get help from the participants if any one of you knows how to solve the problem that i currently encountered in autocadd. I copied objects from one workspace to another workspace, but the objects that i have copied does not show up in another workspace. Maybe somebody knows the command to solve this problem please share. Read to the end, where I discuss ScriptPro. When I copy and paste a few lines from a large 50MB dwg on to a new drawing I end up with a 25MB drawing with about 5MB per line instead of a 400kB drawing!!! What am I doing wrong? When I use copy and paste during paste time nothing is being paste in anywhere. I am using paste special that time only frame paste.tish type of problem coming in only one drawing file. another drawing file in properly working. I have already check layer are unfreeze. I recently upgraded to ACAD 2017. I’ve been using copy with basepoint and paste for a very long time to copy things like title blocks and callouts between page layouts and drawings with no problems. Today, when I paste (Cntrl+V) it pastes a block instead of objects. Any idea why this is happening and how to fix it? Thanks! What should you do when some of the Xref drawings don’t paste over? Do I need to BIND them prior to copy paste? I have a problem text’ position at layout and model. Option 1- In my Model, I have so many text ….. , Z position is zero. I go to layout Make view,.. my texts are not normal… . so I do “chspace” to bring all my text from Model to layout. And I check all my text’s Z position… valve have.. 15.555 . Option 2- In my layout, I change all my text Z position to zero, and i do “chspace” to back all my text from layout to model. Hi. I am using Autocad 2000. I have produced a drawing of my house and am trying to copy and paste the plan of a wardrobe into another drawing so that I can work on it. Each time I copy and paste, no matter which method I use, I end up with the whole house layout on the new drawing. Can anyone tell me how I can work around this? Are you copying from Model view, as opposed to Layout view? When you select, are only the objects you want selected? Is everything grouped or put into a block? Are you pasting into a Model tab? Hi thank you for getting back to me. I am using the Model space in both drawings. I am selecting only the lines that I need and they are not in a block. I have tried turning off and freezing all the layers except the one that I am using with the same result. I.E. the whole drawing is being copied over. i have a problem here . u know i try to copy a text between drawing windows but the problem is , when i do that it can’t copy all the text and i can’t get it what’s wrong with it.please give me some advice. How to copy and paste 3D picture. Please give us instruction and buttons to click. Thanks for the wonderful post information, very useful guide helped me a lot.